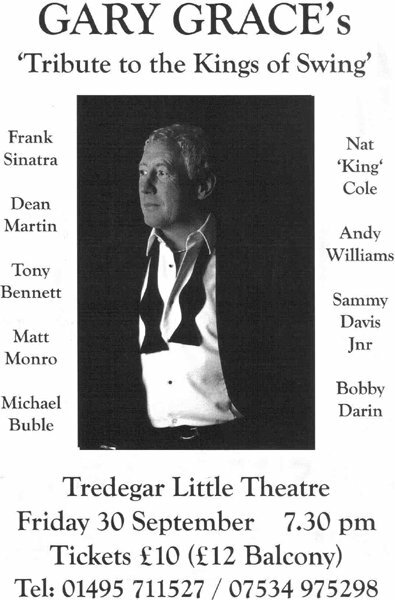 The Tredegar Little Theatre is promising a ‘swinging night to remember’ when international vocalist Gary Grace brings his ‘Kings of Swing’ tribute show to the venue for the first time. Gary has been performing his show to audiences throughout the UK and Europe for many years, as well as further afield, around the world and aboard cruise liners. Appearing with his live band, the show will include classic songs associated with the likes of Frank Sinatra, Dean Martin, Tony Bennett, Nat ‘King’ Cole, Bobby Darin, Andy Williams, Michael Buble and many more. Tickets are: Stalls £10, Balcony £12.